CCP Shanghai’s senior director is not smiling. Unmoved by the colourful MOBA shooters of the moment, where players flow and collide like unmoored boats, his team have made a new Eve shooter in the image of Action Quake and Battlefield 3 – “the strongest FPS ever made”. 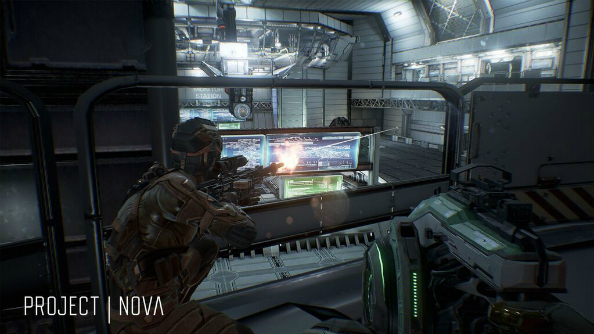 Project Nova is assembled from chrome corridors, where men with guns move with weight and purpose; where battles are won with mouse mastery and cooked grenades, and absolutely nobody is permitted to run on the walls. Hoping to get the lay of the genre? Here are the best FPS games on PC. But there is another, unseen designer steering Árnason’s hand. Everything Dust 514 was, Project Nova is not. In August 2009, the developers of Eve Online announced their first ever FPS. The hyper-ambitious Dust 514 wouldn’t just be set in the Eve universe, it would change it, enjoying a symbiotic relationship with its parent MMO. Player corporations in Eve Online could hire Dust mercenaries to wrest control of designated worlds within the Eve galaxy, supporting the ground assault with orbital strikes, fired from one game to another. In the event, however, most players weren’t involved in the merc metagame. If they weren’t hired, or schooled in the complicated choreography of strike set-up, they were matchmade instead into sub-Battlefield firefights where off-planet bombardments dropped less often than the frame rate. It’s tempting to think that Dust was hamstrung by its ageing platform: the PS3. But Árnason – who became an avid Dust player while working in CCP’s financial department – thinks the FPS would have failed even on PC. Dust was actually developed using a PC client. But when CCP Shanghai put together a team under the name Project Legion to explore the possibility of porting the game, they ran into technical limitations they “couldn’t dig [themselves] out of”. When the Legion team disbanded, some took up tools on Gear VR game Gunjack, others on Eve’s Chinese servers, while the rest returned to Dust. If that sounds morbid, perhaps it should – though CCP continued to work with Dust’s player council and roll out fixes, they saw the “end of the line” on PS3. Meanwhile, CCP were changing. A dogfighting VR experiment tentatively pushed in front of the fingers of Eve Fanfest attendees in 2013 had grown into triumphal Oculus launch title Eve: Valkyrie. CEO Hilmar Pétursson no longer made grand onstage pronouncements about upcoming plans; the ambition remained, but an atmosphere of quiet, industrious iteration took hold. 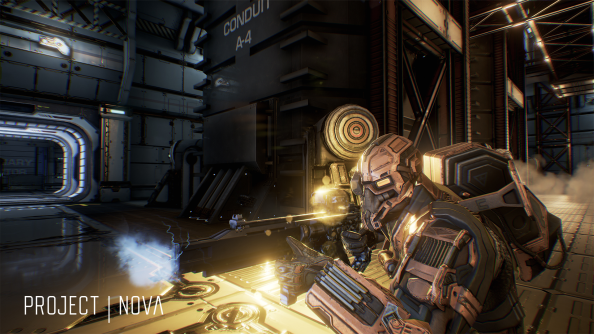 It was into this context that Árnason and a group of likeminded developers in Shanghai pitched Project Nova: another attempt at the Dust dream, but approached from the opposite angle. 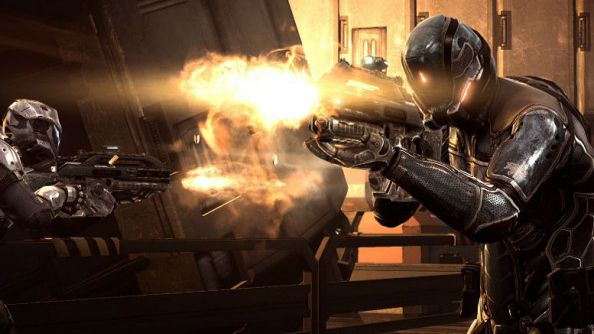 They would build a taut, well-performing shooter that placed players on the decks of Eve ships, but didn’t rely on the MMO’s reputation for corporate machinations. Nova isn’t much further along today. 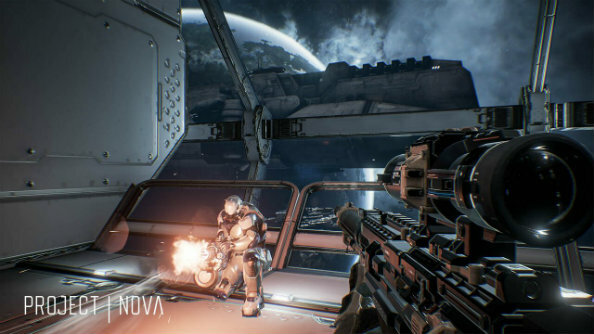 The shooter presented to Eve fans at Fanfest this April was barebones in the extreme – a proof-of-concept control point mode populated by players with militaristic loadouts. Yet it had an identity: jump jets did little to dissuade the sense that this is a very deliberately-paced FPS, in which teams can only hope to take territory through determined and patient assaults. CCP now survey attendees to gauge response to their prototypes. By the close of the show it was clear that, by and large, players liked Nova.